Traversing across northern Pennsylvania – along historic Route 6 – USBR 36 connects New York in the east, and Ohio in the west. The route follows Pennsylvania Bicycle Route Y, and showcases amazing natural beauty and many man-made wonders including the Kinzua Sky Walk, the first steam locomotive, the Zippo lighter, and the first lighthouse on the Great Lakes. 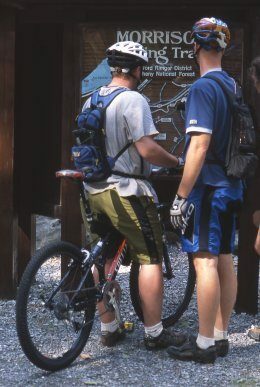 In the Allegheny National Forest, mountain bikes are permitted on all forest roads, all ATV trails, and most hiking and cross-country ski trails. 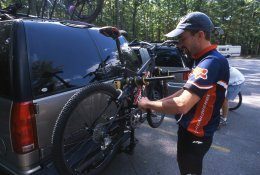 Mountain biking has increased in popularity so much that it’s common to see bikers during all seasons. Morrison Trail is a 10.8-mile loop. Passing through open hardwood forests and large rock formations, the ground cover along the trail is thick with Mountain Laurel. The trailhead parking lot is located along Rt. 59, 17 miles west of the Bradford, PA. The Longhouse National Scenic Byway is a 29-mile paved route around the Kinzua arm of the Allegheny Reservoir. Rimrock and Jakes Rocks overlooks are along the byway; both sites provide stunning vistas of the forest and water below. Plan your trip to experience the blooming of the Mountain Laurel in early June, or the fall foliage in late September and early October. Picnic areas, boating opportunities, and camping are nearby. A few areas exist in which biking is not permitted: Hickory Creek Wilderness, Hickory Creek Trail, Tionesta National Scenic Area, Heart’s Content Scenic Area, and on Tracy Ridge Recreation Area. The Wolfinger Trail System is close to Smethport, PA. Many loops can be made. The main trailhead is located on Rt. 46, north, 1.1 miles from the PA 6 intersection, on the left side by the gate. Maps are available at the trailhead. The new 30-40 miles of trails at Jakes Rocks were designed by Trails Solutions, a world class trail company affiliated with IMBA (International Mountain Biking Association). This stacked loop mountain biking trail system appeals to riders of all skill levels. Many family friendly biking trails are within the region. The Kinzua Bridge Scenic Byway is a shared use road. Highlights along the way include the Kinzua Bridge State Park home of the amazing Kinzua Sky Walk and the Kinzua Bridge Visitors Center. At the park, the General Kane Trail is a 1-mile loop leading through black cherry and chestnut trees. The Shawmut Trail is a 1-mile hike/bike trail that follows Marvin Creek, traversing woodland settings, open meadows, and farm land. Sights along the way include the historic McKean County Poor Farm. The trailhead is located along Route 6, west of Smethport, near the Marvin Creek Bridge. Offers ADA parking and accessibility. The Kinzua Valley Trail is a 7-mile hike/bike/snowshoe trail that meanders through scenic woodlands. The trailhead is at Westline, with the non-paved trail ending at the Red Bridge Campground in the Allegheny National Forest. Rating is easy. Overnight accommodations are available nearby at the Westline Inn. The Blasidell-Emery Trail is a 3.8-mile trail for biking and hiking. The trail has a crushed stone surface, and bridges near Minard Run and Browntown Road. Sites along the way include the historic Penn Brad Oil Museum. The trailhead is located on Owens Way in South Bradford and the trail ends on Main Street in Lewis Run. Trailhead parking is located just south of the Penn Brad Oil Museum along Rt. 219. Trail rating is easy.